Prior to the catastrophy of Asia Minor in 1922, there were over 100 Orthodox monasteries in Pontus. Afterwards they were either destroyed, abandoned or converted to museums and mosques. The documentary above, filmed last year in 2010 after the first Divine Liturgy at Panagia Soumela in Trebizond since 1922, speaks of three of the most famous monasteries in Pontus - Panagia Soumla, Saint George Peristereotas and Saint John Vazelonas. The section above only speaks of the latter. 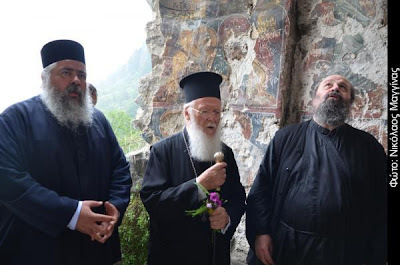 Following the second Divine Liturgy at Panagia Soumela on August 15, 2011, Ecumenical Patriarch Bartholomew, accompanied by Archbishop Demetrios of America and others, visited many of the holy shrines of Pontus, and even chanted "Christ is risen!" at the Monastery of Saint John Vazelonas (see photo below), one of the oldest monasteries in Christendom. Read more about this historic pilgrimage and see the photos here.